Well, it is that time again! The 2016-2017 youth ice hockey season has begun. If you read our last post about our daughter’s hockey season last year, you will already know we had quite the adventure throughout the season! This year I am sure there will be even more adventures. She is going to be playing on two ice hockey teams. 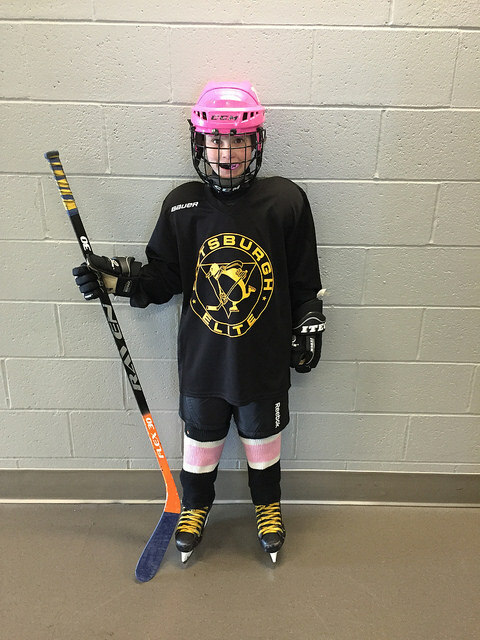 Allie will be playing for the Pittsburgh Penguins Elite U10 all girls team. She is super excited for the opportunity to play for this team. They will have instruction from some of the same coaches that train the Pittsburgh Penguins. She is looking forward to having a chance to learn and grow as a player on and off of the ice. The Pens Elite tryouts were held April 9th-10th. After tryouts she was so nervous that she wouldn’t make a team. When we got the email that she made a team, she was jumping up and down with excitement. 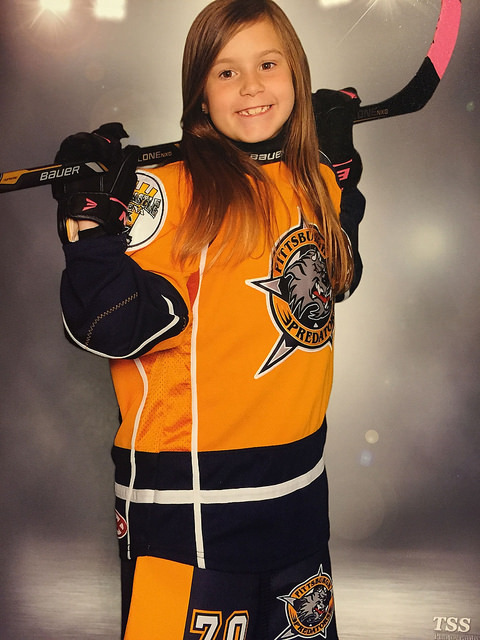 The other team that she is playing for, the Pittsburgh Predators, is composed mostly of boys, but this year will be the first time she will have girls on the team with her. There are two other girls this year and both of their dads are coaches on her team. It should be nice having a coach that knows that girls can hang with the boys. She and one other boy are the only second year squirts on the team, so she is looking forward to taking a leadership role and help the kids transition from cross ice to full ice hockey. Practices for the Predators already began last week and the Pens Elite practices will start in two weeks. So, it looks like for the next 8 or 9 months we will no longer be sleeping in on the weekends. Truthfully, I know it is something I will miss when she is old enough to take herself or car pool to practices, so for now, I will enjoy every morning of waking up at 5 am. This hockey season the she will be playing in at least 6-8 tournaments. Four of them, for sure, with the Pens Elite and the first one is in Canada. Surprisingly in the nearly 6 years of our daughter playing ice hockey, it will be the first time she will be playing in Canada. When we found out we were going to be traveling to Canada, we had to make a mad dash to get out passports which none of us have had before. We were surprised how quick the process was to get a passport card. They say 6-8 weeks, which was cutting it close, but it only took 2 weeks to get them in the mail. Fortunately, the kids did not need to get one because we can just use their birth certificates to enter the country. When we go to the tournament in Canada we are staying close to the Hockey Hall of Fame and that is on the list of things to do for our family’s first time in Canada. If any one has ideas of things to do and see around Toronto, leave us a comment below. Any advice would be great. Since tryouts were right after the last hockey season ended, our daughter took a two week break from hockey. After that, she was going to an amazing place here in Pittsburgh called Overtime Hockey. They have a synthetic ice surface for technical skills, an ice skating treadmill, and an area to do dry land training. The skating treadmill is so helpful. The skaters can watch themselves in mirrors and see what they are doing right or wrong and the instructors there can help correct improper stride so they skate stronger and faster. The video above is from when we went to tour and test the place out almost a year ago. Allie enjoys going there so much that after her two week break, we were there every Monday, Wednesday, and Friday for an hour of technical skills, 30 minutes on the treadmill and an hour of dry land training. It is amazing to see how much she has improved from the training that Overtime Hockey provides. We will keep updating the hockey section of the blog throughout the hockey season with all of the adventures we have and how much she has grown as a player. 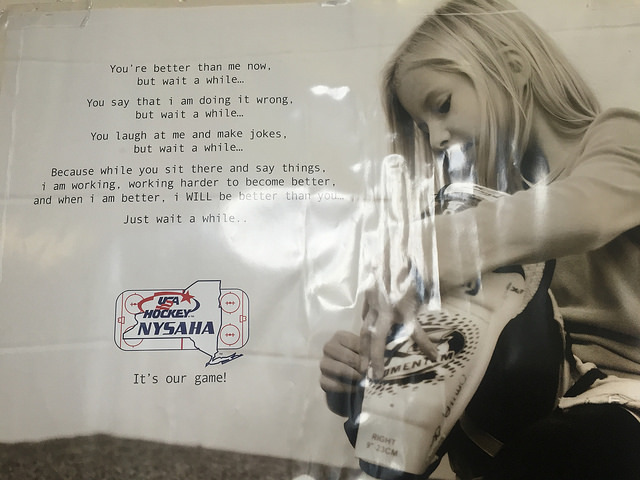 For now, I’ll leave you with a picture of a poster we saw at a tournament in New York. Just wait a while….. Tagged Girl Hockey, hockey in pittsburgh, Ice Hockey, Play like a girl, usa hockey, Youth ice hockey. Bookmark the permalink.